I spent some weeks in Winter 2001 in Massachusetts, located near a town called Franklin, named after Benjamin Franklin, from where I was able to ride into Boston on MBTA (Massachusetts Bay Transportation Authority) aka "The T". This means that I was able to ride on Saturdays, during my weekend days, as of course I was occupied with other things Monday to Friday. Also the weather played a big part in my ability to get out, as there were various falls of snow, which had the effect of making everyone scurrying to the safety of their homes, pausing only to empty the supermarket shelves on the way. My first weekend was constrained by snow, but I do recall watching the inaugural for President George W Bush on Saturday 20th January. Overall my recollections are not helped by not making notes at the time, but I believe that this collection is from Saturday 26th January 2001, when at last I was able to get out a bit. While Franklin has its own depot in town, I chose to use the Forge Park Park & Ride facility not far from I-495, as this was only a short drive, and there was easy parking. This is the terminus of the 30 miles Franklin Line route from South Station in Boston, opened as a line extension in 1988 (on the route of the Milford & Woonsocket Railroad, which last saw service in 1938). I did choose to ride upstairs, and I recall that I drank coffee on the route inwards, which must have come from a trolley with attendant. Locomotive 1035 is a 3000hp M-K F40PHM-2C, built by Morrison Knudsen (MK Rail) at Boise, ID (0990-11 of July 1993), and again rebuilt by MPI (successor to MK Rail) in 2003-04, after this photo was taken. It currently remains in service. These locomotives have separate power for HEP (head end power, which is ETH). 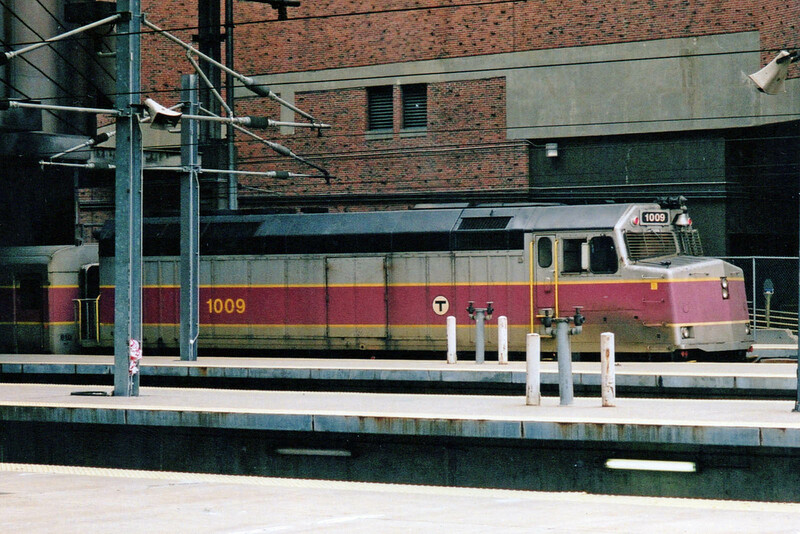 F40PH 1009 (EMD 776066-10 delivered September 1978) and rebuilt in 1989-90 by Bombardier. Sidelined in late May / early June 2014, then moved in storage in mid-2015. This was the period soon before the Acela trains appeared. 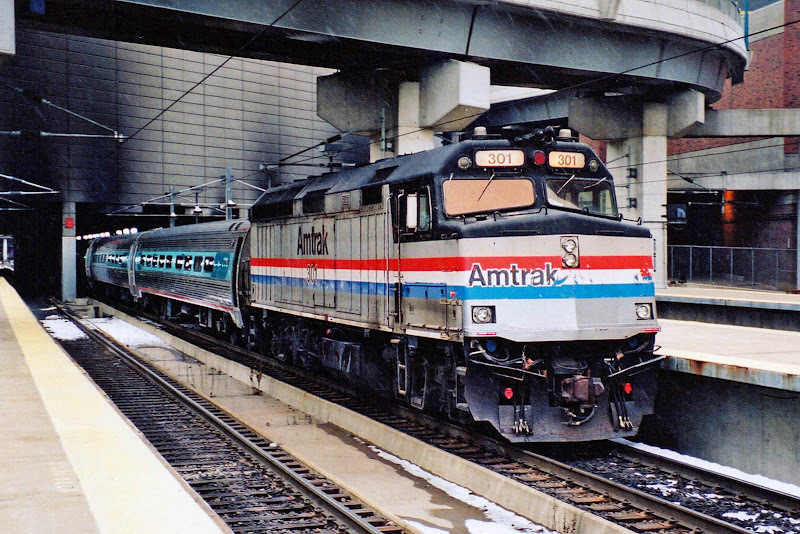 Here Amtrak 939 is seen on the stops at South Station upon arrival of a North East Corridor service. 939 is an EMD (licence built Rc4 from ASEA) AEM7, 806004-10 delivered in 1981. 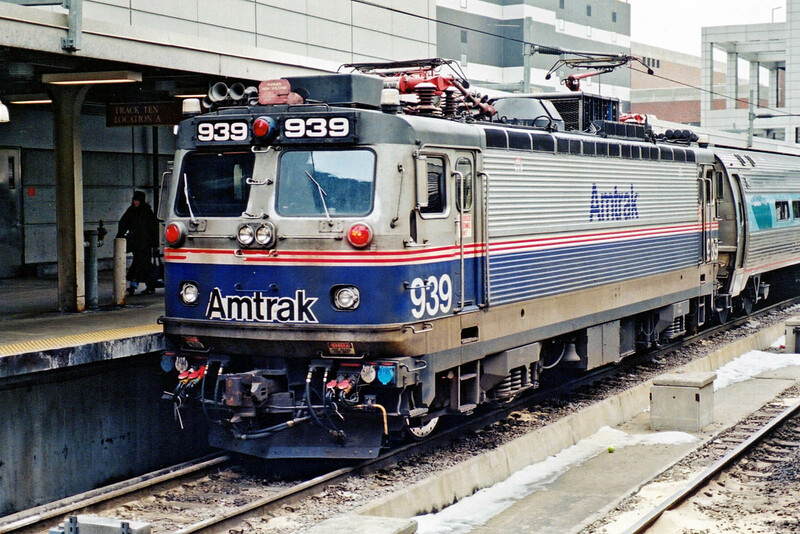 939 was converted from AEM7-DC to AEM7-AC in April 2002, after this picture was taken. The AEM-7DC series are all now withdrawn, and the AEM7-AC series are in course of being withdrawn. 939 was still in traffic in November 2015, supporting heavy traffic at Thanksgiving, also here from a well known US railway author and photographer. However it seems to have been withdrawn thereafter, as I have seen a note that shows only 6 were in traffic by late January, and 939 was not one of these. By end of March 2016 there appears to be little activity, but rumours of 10 going to MARC. 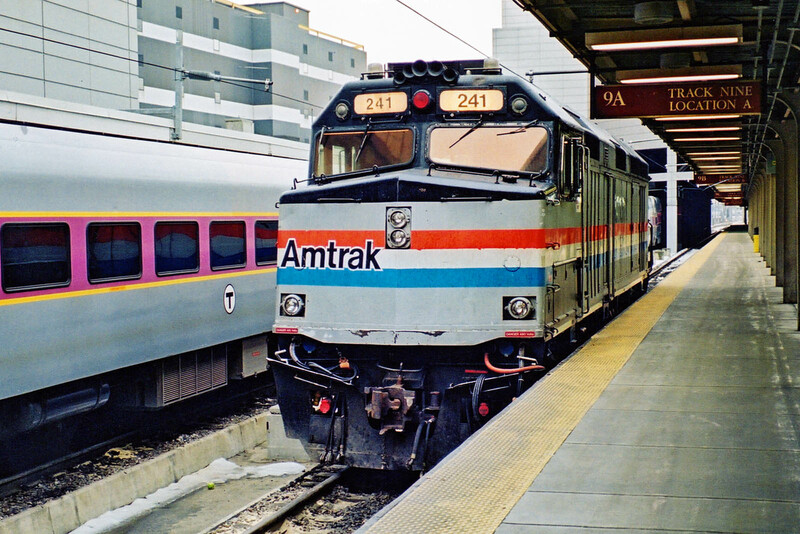 Amtrak F40PH 301 (EMD 786140-2 of April 1979) at South Station. Stored at Renneslaer, NY in 2002, later West Lafayette, OH by 2005. 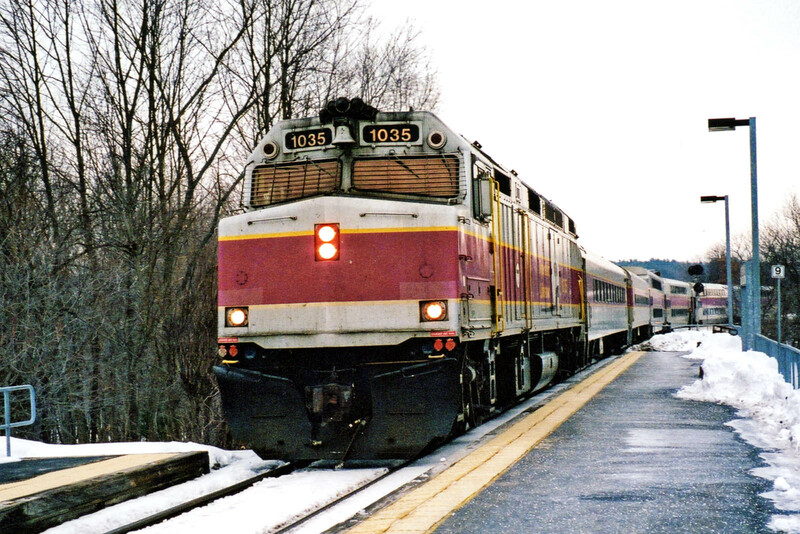 Moved through Derby, ME in 2008, and sold to RailWorld, OHCR 301, then returned to traffic around February 2010 for AMT in Montreal commuter service, in use until 2012. Noted in March 2015 headed for lease at MBTA SLC 301, but in a dead line by July, although saw usage as a cab control car in January 2016. At some point it was available under auction. Similar F40PH 241 (EMD F40PHR 777001-12 of September 1977). In 2002 it worked on the Alaska Railroad, and by 2005 was working for Ferromex in Mexcio, became IANR 678 of Titan Transit (Hawkeye Express Company LLC, Subsidiary of Iowa Northern Railway).